4 hospitals, 16 Surgeons, including 3 staff surgeons and 13 residents. Course sponsor: Project Haiti, Inc. We acknowledge this course is made possible through the generous donations of Cuyuna Regional Medical Center, Crosby, MN and Riverwood Healthcare Center, Aitkin, MN. Lecture content included the history of surgical innovation and teaching at Hopital Bienfaisance, history of laparoscopic surgery globally, safe and effective use of laparoscopic instrumentation, a variety of general and gynecological surgical procedure lectures utilizing minimally invasive techniques delivered by all members of the Haitian and American faculty, and 2 SAGES lectures on the Fundamentals Use of Surgical Energy (FUSE), given in both French and English. Flash drives containing all lecture materials were provided to each student. New iPad-based trainers were utilized successfully in the Inanimate Skills Laboratory. The SAGES Fundamentals of Laparoscopic Surgery (FLS) program was utilized as the basis for the lab. The annual Endo Olympics competition was held with spirited camaraderie among the participants. Surgeries included 6 laparoscopic cholecystectomies, a laparoscopic hiatal herniorrhaphy and Toupet fundoplication in a patient with severe GERD, a laparoscopic Heller myotomy and Dor fundoplication in a patient with severe achalasia, 2 diagnostic laparoscopies with surgical intervention for infertility, 2 open procedures for myomectomy, and a laparoscopic jejunostomy with esophageal dilation in a critically ill and malnourished man following a battery acid ingestion. 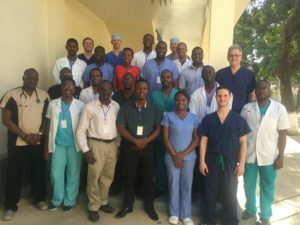 Two of the lap choles were conducted with 100% Haitian staff, including Dr. Sylvio Augustin as the lead surgeon, 2 residents assisting, along with anesthesia and a surgical tech. Of particular note was the excellent anesthesia service provided (all performed by our Pignon staff! ), which enabled the team to accomplish a first-time achievement: completion of 4 lap choles ina single day in the main OR, despite being performed in the slower paced instructional mode. This was due to the excellent clinical care and efficient room turnover between cases. At the end of the week a rooftop graduation celebration was held at the Minnesota Dorm with a traditional Haitian feast and recognition for all participants and the esteemed Endo Olympic medal winners. Dr. Guy Theodore was in attendance and provided closing remarks at the celebration. Dr. Paul Severson, Dr.Andrew Van Osdol, Dr. Aaron Sachs, and Ron Vitales followed up on last year’s initial visit by installing a donated Stryker laparoscopic tower, delivering lectures to residents and faculty, donating Laparoscopic Skills Training equipment and supplies, and conducting the first laparoscopic surgeries at the university. 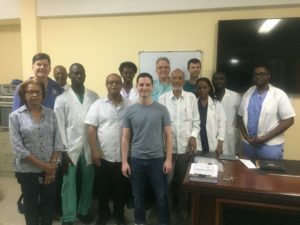 Dr. Nesly Vastey, Chief ofSurgery, and Dr. Maurice, Assistant Chief of Surgery, hosted our team and provided excellent support, communication, and hospitality. Lectures were attended by all of the residents and the surgery suite was crowded as the first laparoscopic procedure was performed. Recently graduated Chief Resident and Endo Olympics Gold Medal Winner, Dr. Celisca Fornabial, and General Surgery Resident Dr. “Nash” Dorsainvil were mentored in 2 laparoscopic cholecystectomies and 2 laparoscopic appendectomies. Dr. Celisca was the lead surgeon on the final laparoscopic cholecystectomy and performed very well. It was a solid start to implementing a laparoscopic program, and robust discussions were held to communicate on-going training and development. We will plan to make follow up visits to La Paix to continue to assist with their training. Dr. Andrew Van Osdol and Dr. Paul Severson plan to return to La Paix in the fall to continue the mentoring process. After our day of surgery at Hopial L’Universitaire La Paix, we traveled to HUEH to meet with Dr. Frank Telemaque, Chief of Surgery. Upon arrival we were pleasantly surprised to find select surgery staff along with the entire surgery residency program in attendance to welcome and thank us. Dr. Telemaque then made a formal presentation and recognition for Dr. Severson’s 30 years of investment with the Haitian people. 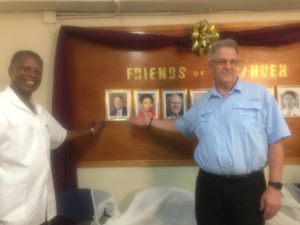 A “Wall of Friends,” containing photographs of 7 instrumental health care leaders was revealed, and Dr. Telemaque took great pleasure to note that Dr. Severson is #1 on the wall. A champagne toast was held and fresh pastries were enjoyed by all in attendance. We then traveled to Petionville to attend the Port-au-Prince Chapter Rotary meeting at the request of Dr. Vastey. We arrived at the Kinam II hotel and were graciously welcomed by the leadership of the Rotary Club. After a delicious buffet dinner, a formal recognition was made to Dr. Severson for his years of service to the country. Dr. Severson thanked the chapter and emphasized the numerous successful projects that occurred because they were joint ventures with Rotary. We found the Minnesota Dorm clean and well maintained, other than lacking hot water on this trip. The internet was functional. The food prepared by our wonderful cooks was exceptional and enjoyed by all. The staff at HBP also provided amazing support for the entire team and visiting surgeons. Thank you!! We also enjoyed the accomodations and cuisine at the Cormier Plage near Cap Haitien at the end of our work week, before parting with half of our team, who flew back to the US through Cap Haitien on American Airlines. Sunrise Airlines was operational, and our Port-au-Prince team flew from Cap to Port without incident and were greeted and graciously welcomed by a large delegation of surgeons at the airport. Our team of four stayed at the Ideal Villa Hotel, which is approximately 15 minutes from the La Paix Hospital. The hotel has been very well maintained, is secure with an armed guard and gate, and we found the food for both the hot breakfast and dinner to be quite delicious. The room rate of $90 per double, which includes breakfast, and is very economical. On future visits to La Paix, we would recommend utilizing this hotel located in Delmas and not far from the airport, as an excellent choice and an economical alternative to the Matthew 25 house. It was easily booked online by credit card, and for the same price as Matthew 25, it has a restaurant, bar, internet services and a swimming pool. However, Matthew 25 has the advantage of the free and reliable airport shuttle. 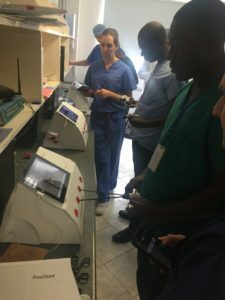 Posted in 2019 and tagged Haiti, minimally invasive surgery course, Pignon, project haiti. Sounds like it was a great trip, sorry to miss this one. Glad I could help with remote support when needed, looking forward to next time!